Getting the best present is simply not enough because leaving a gift unwrapped removes the sharp desire and the curiosity of wanting to know what’s inside. That is why we want to help you with creative gift wrapping ideas. In this write-up, we have listed awesome gift wrapping papers, storage carts as well as some books to spice up the act of giving a present. Wrapping papers like Adorox and Classystylez are among the papers that will help make your gift more inviting. We also listed storage bags like Master craft storage cart and Household essentials to help you store gift wrapping items so you don’t go in lack of them. Books, like “It’s a wrap” will go as far as teaching how to create or customize the present to give to your loved ones. We trust you get the best help you probably have been seeking in this in-depth gift wrapping ideas listed below. 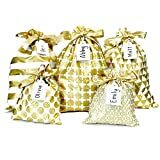 Reusable Fabric Gift Bags – Set of 5 Bags – Wrap Presents in Seconds! Creative Hobbies Rainbow Color Tissue Paper Bonus Pack, 20″ x 26″ Sheets, Assorted Colors, Pack of 100 Sheets! 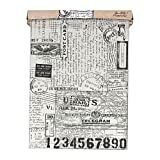 Tim Holtz is a 12 inch by 15-foot vintage-mail design wrap from Postale collection. The wrapping paper speaks of a multitude of drawings or sketches superimposed on translucent tracing paper. The semi-transparent paper offers softer and more classic look. The wrapping paper comes as a continuous tissue roll and can easily be torn off through its cutting teeth without destroying the remaining part. The patterned paper is stronger than tissue and sure to impress. It is high quality and stands out design-wise. It can be used for wrapping any kind of surface up. Some may expect it to have a different pattern all through but the design repeats at a certain point. This is ideal for covering all kinds of surface. It allows you to add colors, multiple decorations or any other creative addition that will impress the recipient. We like that you can also it as background collage fold it up to make certain corners. Kraft Wrapping paper has plenty rolls of color for all occasions including birthdays, Christmas, shower, wedding, holiday and congratulations. The different patterns include Casablanca, wide stripe, Geo Block, Large Polka Dots that mix fine blue and cream hues. It makes hand-wrapped gifts look special and beautiful. The wrapping paper is the way to go if you like uniqueness. Its thickness is bound to make the recipient build up the anticipation for the the present inside. Different from Tim Hotlz, Adorox is a cellophane wrap roll. It is an incredible gift wrapping idea we found suitable for wrapping up gift baskets, crafts, desserts, flowers, Christmas gifts or presents, hampers and more. One roll of Adorox wrap is a lot measuring 40 Inches Width by 100 feet long. The pricing, lasting advantages, and a clear wrap it offers won our hearts. It is one of the most popular wrapping materials. It may be bulky for some people who might want a lighter wrapping roll. 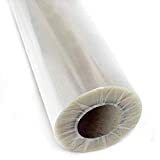 This wrapping cellophane is high quality and a good bargain. It wraps effectively and matches anything used on it. We think it is the best choice if what you want is making the recipient see all the items even before it gets unwrapped. Typical of its name, this ClassyStylez is a bright colored tissue paper that features a classy design. The paper is suitable for packing different items like flowers, pompoms, gifts baskets and more. It can serve different purposes including being used for arts and crafts. Produced with 100% virgin wood pulp, the wrap is organic, sturdy and lacks harmful chemicals or acid. ClassyStylez beautifies your gift items and adds distinctive emphasis to the overall package. It comes with 110 sheets in all ( 10 vibrant colors and 10 white tissue paper). Wrapping with this colorful material can increase the element of surprise when it comes finding out what’s in the package. Offers enough papers for more wrappings. This wrap can take care of most things as long as it is a wrapping task. Its colors have a way of causing a happy mood to the recipient even before the gift gets opened. You can combine the colors to get a cute burst of colors. Though wrapping larger items might be more problematic, as it only measures 20″ x 30″, a little sense of creativity will handle that. Reusable Fabric Gift Bags – Wrap Presents in Seconds! These Fabric gift bags add a leg up to your present giving. They are safety bags that can serve perfectly in last minute purchase of a gift. Made from cotton the bags are durable, the bags are handmade to deliver effectiveness. 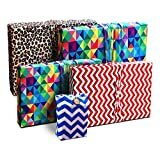 They provide enough space (five set of bags with three measuring 12×16 and two 8×10 for even bigger items) and you won’t have to break the bank to get them. Gifts stay safe with the ribbon casing ruffle used in tying the top part. It saves time and is suitable to a gift wrapper who is unwilling to wrap. It is eco-friendly as it reduces the quantity of trash especially the morning after Christmas. It is durable and can be used more than once. Most people prefer to wrap their gifts and not just putting them in a bag. If you don’t like dealing with ridges that are usually seen after gluing wrap papers, then this is your best bet. It is easy to use and does not cost much. It does not warp during storage so the remaining ones can serve even after a long time. This Wrapeez Gift Wrap Pack is made to spice up the act of giving a present to someone. Its magic is in a traditional detail, featuring cool colors without much fuss. Made with spandex or Lycra, the wrap pack is elastic, thus can be stretched to different shapes and sizes without breaking or ripping it. The Gift Wrap Pack also produces bow effect and does not require scissors or tap during wrapping. In all, it has a creative design and is highly durable – can be reused, so the recipient gets double gifts in one wrap. It wraps perfectly and faster than most wraps. When overstretched, you can see through the stretchy fabric. It comes in different bright colors. The wrap is quite versatile and can wrap up just about anything including picture frames, tablets, books, clothes, toys, shoes, laptops and more. It contains two medium gift wraps, two small gift wraps, and one gift card holder. If you want to alarm or really shock the recipient with your gift you can create a paper fringe or streamers using this rainbow color tissue paper. You can use it to wrap gift baskets, bags, arts, and craft. It is bleed and flame resistant. It is sturdy though it is a tissue paper. The many colors may not impress someone who likes simple gift wrapping though they are on a plan background. If what you need is a gift wrap with a decorative border or edging of hanging threads, cords, or strips, this is one of the papers to give you the best result. It has the quintessential holiday and even birthday colors thus versatile. Above all, it allows you to explore your decorative skills. 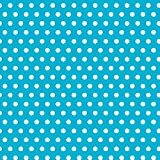 Amscan Classic Polka Dot Jumbo Gift Wrap design provides uniqueness that speaks well of any person giving the gift. The wrap combines crisp white with several other background colors including Caribbean blue and pitch. It measures 16′ x 30″ which means it can conveniently wrap up a sizeable surface. It makes wrapping less complicated. You will get the most out of this product if you are a polka dot person or want to gift such person. Its design is exceptional and looks fine when used on gifts. We like the overall ease of wrapping only that it may tear if not carefully handled. Another aspect of gift wrapping idea is getting organized. By that, we mean stashing your extra wrapping items or supplies properly. There are numerous bag organizers out there, here are a few to help you get organized. 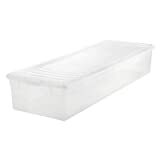 This IRIS USA Wrapping Paper Storage Box is a transparent wrapper organizer or container with a lid that is large enough to take 30 rolls of wrapping sheets. The organizer takes about four Iris ribbon and craft organizer boxes. Storage is no problem since the container is quite slim and can easily be stored under the bed. Looks nice when stacked with wrapping rolls. It helps your gift wraps to stay organized until needed. You won’t get it at a low price when compared to others. It may not accommodate longer wrapping rolls. If you are tired of looking for your gift wrapping supplies like ribbons, paper and more anytime Christmas or a loved one birthday is near, this is a great pick for you. Of course, you don’t want that to always get in the way of your fun. One of the favorite parts to this organizer is the fact that it is bound to serve different purposes and can last for a longer time than expected. Whitmor Clear Gift Wrap Organizer is another great product to help you keep all your gift supplies organized. The hanger possesses 23.25″x46.75″ pockets to keep everything like gift wrap, bows, ribbon and other wrapping accessories. It features a creative design with a fabric body and clear pockets. It is portable and can easily be stored over the closet rod or door hooks. Pockets offer enough space for storage. If you don’t have space for a big cart, but have a door with a hook or closet rod, then you might consider this product which allows you take advantage of such spaces. We like that it can accommodate most of your gift supplies. Grayline storage system is a shelving system that gives you a storage room enough to allow you label items by occasions like birthday, wedding and more. It also allows you to reap from the advantage of vertical and horizontal space. It can hold up enough items. It can be mounted on the wall which makes storage easy. It is constructed with PE coated steel which makes it more durable. It can be adjusted to different positions or heights. Can fall off when mounted if the items seem weighty. This portable wall shelve will allow you organize your gift wrapping items. Though slightly pricey, you are sure to get the value of the money you spend. Master Craft Gift Wrap Storage Bag. Provides enough storage space for ribbons, tapes, bows, tags rolls of wrapping paper and more. It can not be mounted on the wall. The interior is moderately deep which may not impress those who want a really deep bag. If you want something that can easily be transferred or carried about for your wrapping items, this bag is a sure bet. It is portable storage solution for your gift items. This Polyester wrapping storage bin which has a lid and handles as well as carbon dividers offer excellent organization features. The handles are stitched tightly to prevent it from ripping easily. There are compartments where you separate the wrapping rolls according to the occasions. 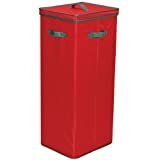 In terms of capacity, the bin measures 32 inches high, 11 inches wide, and 13 inches deep which means sufficient room for your items. It is sturdy with a reinforced base and side panels. Makes packing and maintenance easy. The lid may not completely tight when very large rolls are stored in it. If you want something that is light, holds more items, durable and deeper, this is your standard. We think that very long wrapping papers may not fit but this offers standard quality and effectiveness that you’ve probably been looking for. It’s a wrap is a book you will thoroughly enjoy. It has a tutorial for sewing and wrapping fabric strips around clotheslines into cute containers of different shapes and sizes. This means you can create your own work of art through instructions that are clear and easy to comprehend. The craft book also features inspirational pictures showing you how to use a simple wrap, coil, and sew technique to achieve magic in form of bowls, bags, baskets and more. Who knew pottery could be sewn with a machine? Well, this Barbara Warholic’s book teaches how to create shaped-like pottery with flexible fabric to produce soft pottery. Also, the book is interpreted in a straightforward way that even a novice will grasp it easily. There are pictures that also show ways to create pots with necks, handles, rims and teapot spout by joining pieces using soft fabrics. This book goes to show what has become an activity that even adults do these days to relieve stress, relax, and save the mind from overpowering thoughts. The book offers 50 fantastic patterns created to captivate and spark imagination that will motivate inner creativity. You can select a pattern based on your mood but they all end excellently as a great work of art. And what’s more amazing is that you don’t have to be an expert with plenty experiences to create something unique. Though the reason for any gift is important, the wrap it comes in also counts. This is basically why we have listed some great wrapping ideas to help you perfect gift giving. They are essentials for every occasion and a definitely sure to make your gift more appealing to the taste of the recipient.